Your service offering is the service you are selling to the public; whether it is cloud storage, web hosting, or project management, Servicebot can help you with all of these and more. 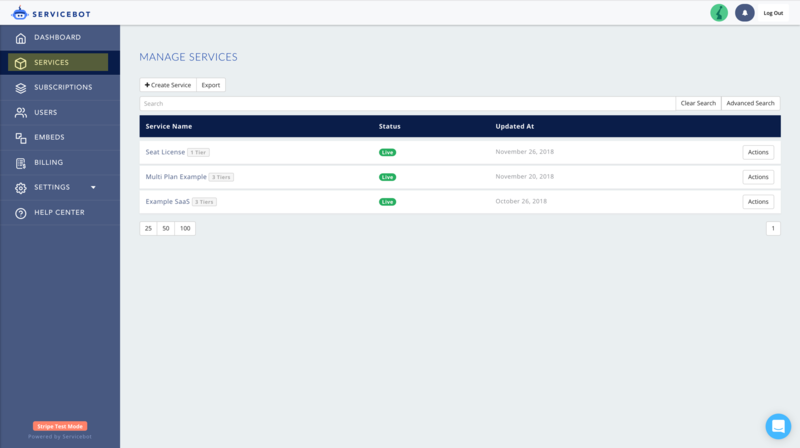 Servicebot offers a user-friendly interface for you to create a template for your service including pricing tiers, billing types, trial period, and features for each pricing tier. 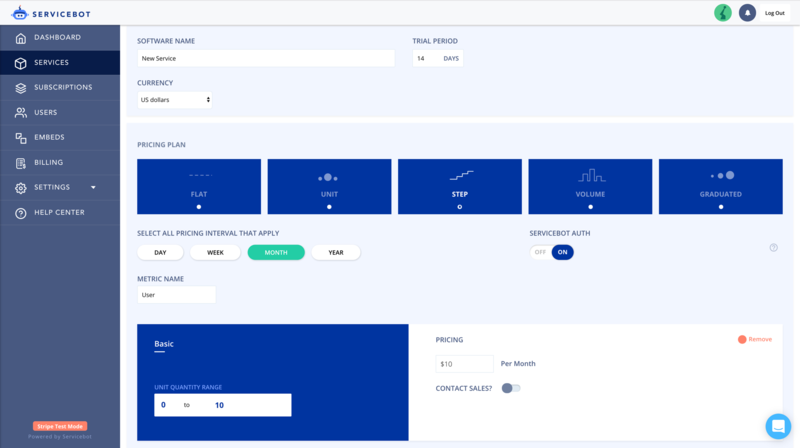 This template will be used to generate custom code for a pricing page, sign up/checkout page, and billing settings page that you can embed onto your own website. Navigate to Services on the left sidebar. 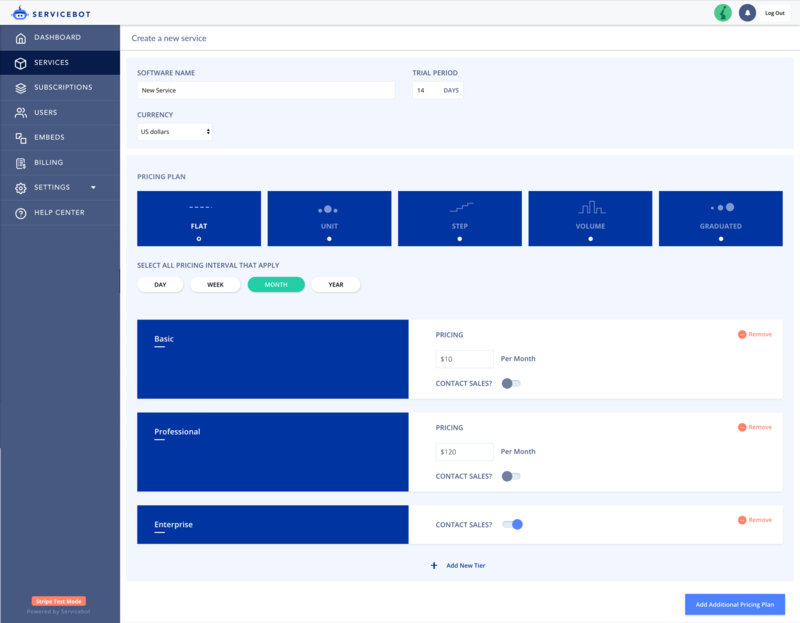 This will bring you to the Service Management page where you can create, edit, and delete service offering templates, as well as perform other actions, such as manually request a service for a user. But we are here to build a template, so click Create Service for now. Enter the name of your service in the first field (e.g. Carl's Cloud Integrations). However, you can assign whatever names to your tiers that you want. 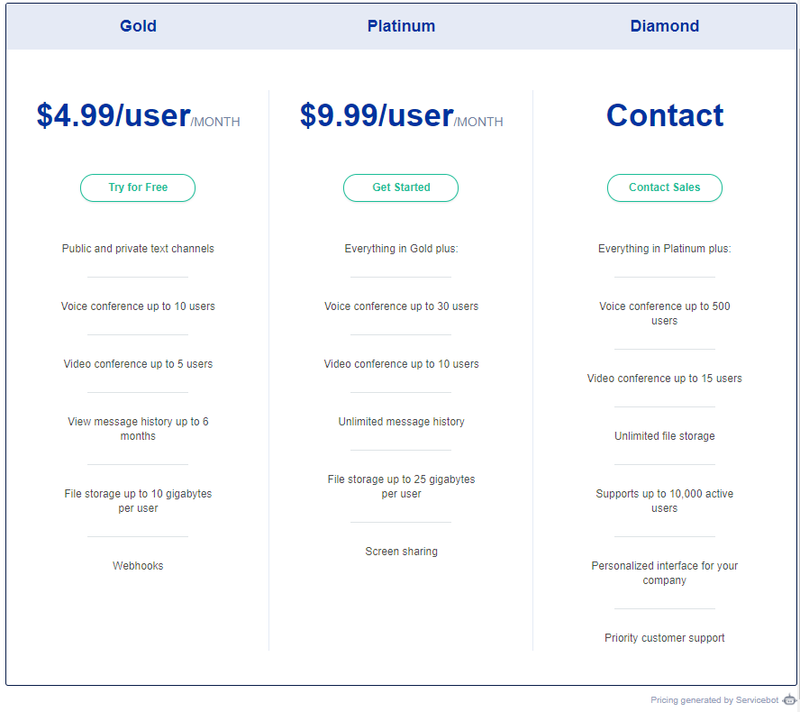 Keep in mind that the names you enter will be displayed on the pricing table embed created by this template, so you want your users to be able to understand them. Click the plus sign on the bottom to add more tiers. Quote (customer requests the company to quote a custom price for their specific needs. Often used for large entities with a high volume of usage or any service that is tailored personally to each customer like Enterprise tiers). You can have multiple billing types within the same tier. Just click Add Pricing Options to add another billing type. For example, you can offer a better deal for yearly subscribers compared to monthly subscribers. In the above example, this tier is a subscription, billed $10 on a monthly basis for the first 10 users. The trial period is optional -- if you want to give users a free trial for your service, enter the period in days that you want the period to last. Leave the field as "0" if you do not wish to offer a free trial. Servicebot can use webhooks to your SaaS to automate the subscription lifestyle, such as when a customer's free trial ends or they cancel their subscription. Some SaaS pricing models use metric billing, also known as usage-based billing. The metric is the unit of measurement that the customer's price will scale with. Depending on the type of SaaS, some common metrics employed are per user, per transaction, or per 100 gigabytes of storage. To use metric billing in your pricing model, click on the blue button to the right of the tier information you just filled out. Enter the name of the unit of measurement you wish to use (user, transaction, etc). Update your price to reflect the per-unit pricing. Note how the above example looks just like the one from earlier, except it is using users as its metric, charging $4.99 per user per month rather than a flat subscription fee. Once you are finished with the pricing options for each tier, you are ready to save your template by clicking the Save and Embed button in the bottom right. This will immediately direct you to the embeds page where you can create a pricing table, billing settings page, and checkout page. This is a pricing table generated from the example used earlier in this guide. 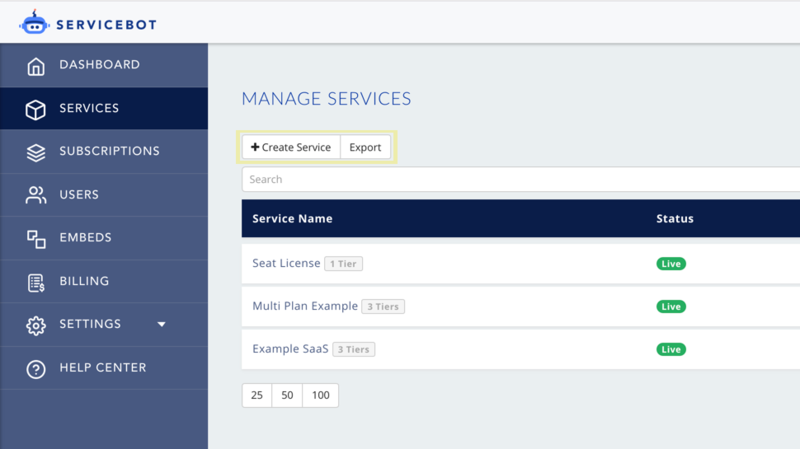 Read How to Configure a Pricing Page to create one for your own service offering template!